The New York Police Department (NYPD) forms the largest law-in-order organization in the city. The organization has over 35,000 officers working to keep the city safe—and residents can rest easy knowing that these officers can boast their territory as one of the safest large cities in the country. Their department works from an imposing structure in Lower Manhattan—One Police Plaza. 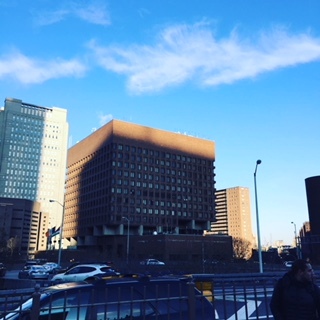 Built in 1973 by Gruzen and Partners, One Police Plaza’s design is what is called an “inverted pyramid”, meaning the building narrows at the bottom and widens skyward. The building’s “brutalist” style showcases many small windows and large exterior panels, two features that help the structure create an imposing dominance over its surroundings. Not only the location of the NYPD commissioner’s office, One Police Place is also home to the department’s advanced computer equipment, among other commands. And beyond the building itself, there is a neighboring plaza with a small public art piece composed of five interlinking circles—each for one of the five boroughs. Most people have a passing familiarity with this seemingly anonymous building, as it features prominently in the TV series Law and Order. The building itself has a smaller role in many films and other TV series such as Brooklyn Nine-Nine. For a commanding tour, see New York City with Sights by Sam. New York, like London and Hong Kong, has subway shuttle lines. These lines, unlike the others in the system, shuttle between only two (or sometimes up to five) points on the system. While many of the regular numbered and letter trains of the NYC subway system function as shuttle trains after hours, there are three dedicated shuttle services on the system: one in Brooklyn, one in Queens, and one in Manhattan. The three services also correspond with the former subway companies that serviced the city: the BMT, IND, and IRT. The Brooklyn service is the Franklin Avenue Shuttle. This line links about two miles between Prospect Park and Franklin Avenue. The train links BMT, IND, and IRT services together between four stops and provides a great way to get to Prospect Park and Bedford-Stuyvesant. Once part of a late 1800s railroad, this shuttle was truncated in 1963. Known for most of its history for its low ridership and accidents from time to time, the Franklin Avenue Shuttle was rebuilt extensively and is unique as it is the only line on the system that is single-tracked. The service also uses two-car trains due to its diminutive ridership levels. The Queens shuttle is important, linking a stop on Broad Channel to Rockaway Park, a distance of two whole miles being covered with only five stops. This shuttle has been in operation since 1956 and connects some of the farthest-flung communities in the city to the rest of the system. While the shuttle could be impacted by hurricanes (as happened during Hurricane Sandy), the Metropolitan Transportation Authority worked hard to bring the line back up to code and operational again. In terms of the shortest shuttle ride—and the most famous—there is the 42nd Street Shuttle. This line operates at all times, excluding late nights, and covers 2700 feet in less than two minutes. Originally part of the IRT subway line, the 42nd Street Shuttle was configured in 1918 and has kept its form since then. The shuttle’s line was part of the original IRT line that ran between City Hall and Lower Manhattan to 145th Street in Upper Manhattan via Grand Central and Times Square on 42nd Street (where the shuttle currently operates). One of the more interesting proposals for the line that never came to pass was the idea to replace it with a conveyor belt system. A fully automatic train was put into use on the shuttle for a brief time in the 1960s, but was withdrawn due to cost issues and a fire in the shuttle passage. The shuttle today is known for its train interiors wrapped in advertisements, as it is one of the busiest in the system. The shuttles on the NYC Subway are some of the more unsung heroes of the system. Although they are not the subject of famous songs (such as Take the A Train), these lines help to alleviate pressure on the others of the network and to get people between lines more expediently. The rides on these trains are also unique among the various subways of New York for their scenery and riders. Catch the best tours of NYC (transit-focused upon request) with Sights by Sam. New York is indisputably the largest city in the United States. As with most large cities, there are several centers for jobs. Already, the city contains three of the largest business districts in the city (Lower Manhattan, Midtown Manhattan, and Downtown Brooklyn). In addition to these commercial areas, there are several other developments classed as “cities within the city”. Two of these districts immediately spring to the minds of many New Yorkers: Rockefeller Center and MetroTech Center in Brooklyn. At the moment, a new 28-acre development, the largest of its type in the United States, is under construction. 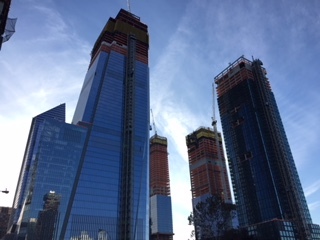 When completed in the mid-2020s, Hudson Yards is expected to be a major new district and a “city within a city” in the densest part of New York City (Midtown). The Hudson Yards development is being constructed over the rail yard for Penn Station. This area had long been one of the last undeveloped areas of Manhattan, with the Javits Center being completed as the only part of various master plans to add civic, commercial, and residential space on the island. In preparation for an attempt to host the 2012 Olympics (won by London), the far west side of Manhattan was rezoned by the City Council. This paved the way for development (first for an Olympic Stadium and then a stadium for the New York Jets NFL team). After bureaucratic hurdles were cleared, construction began on 16 skyscrapers that will cover millions of square feet of commercial office, retail, and residential space. When fully completed at some point in the 2020s, Hudson Yards will sport two large buildings over 1000 feet tall (30 and 35 Hudson Yards). In addition to corporate headquarters, the development will also have shopping, an observation deck, and a large public plaza (with a distinctive public art structure in the middle of said plaza). The Hudson Yards will also be easily accessible from the High Line linear park. The development can be seen on an “Architecture: Building New York” walking tour through Sights by Sam, or by a personalized tour of the area. New York is one of the largest ports in the United States and a point for cargo coming into and leaving the country. As an island and at the entrance of the Hudson River, the position of the city forms a natural choke point for passengers and especially freight heading to Upstate New York, New England, and Long Island. This article will cover some of the freight infrastructure that keeps New York going. As mentioned on many Sights by Sam tours, the Port Authority of New York and New Jersey (PANYNJ) operates the seaport of the region. The port, which is concentrated on Staten Island and around Newark and Elizabeth, New Jersey, handles millions of tons of cargo per year. As it has grown, the PANYNJ may expand port operations for a small berth in Brooklyn at the historic Red Hook piers, which was the site of break-bulk cargo operations (and is famous for being where On the Waterfront took place). The port has also been expanded to handle post PANAMAX ships (a project that included raising the Bayonne Bridge from 155 feet high to 215 feet high). In terms of freight rail, the most famous piece of infrastructure is the High Line linear park (which can be seen on the “Architecture: Building New York” walking tour from Sights by Sam). As New York is dense and on islands for the most part, it is not the easiest place to operate a freight railroad. Before the opening of the Holland Tunnel, rail ferries were popular for freight—passengers had to take ferries from New Jersey rail terminals until the Hudson and Manhattan (today the PATH train) and the Pennsylvania Railroad tunnels opened in the early 1900s. While the PANYNJ does operate a ferry for rail cars to move from Jersey City to Brooklyn, it remains little-used compared to truck traffic and mostly is used to load and send the city’s garbage to landfills in distant areas. On the subject of trucks, New York would stop without the army of trucks hauling 400 million tons of cargo into the city annually. Of late, there has been a large increase in the use of trucks due to the proliferation of online shopping and home delivery services, both of which employ delivery vans to come directly to a consumer’s building. As there is a prohibition on most 18-wheelers in the Holland and Lincoln Tunnels, the vast number of goods vehicles are box and medium trucks, in addition to customized vans. The number of them has been increasing and has led to calls for limits on their loading times—they frequently double park on busy roads and must be driven carefully to avoid hitting people, bicyclists, and other motorists. The NYPD issues thousands of dollars worth of fines daily to these conveyances (with some delivery companies settling out of court every year with the city regarding their summonses). A freight rail tunnel has been proposed by Manhattan and Bronx politicians to reduce air pollution in their districts, but the measure is opposed by political interests in Brooklyn and Queens, as they feel the truck traffic will simply migrate over to them. As you visit and walk around the city, remember that all of the consumables, goods, and other objects had to arrive in town somehow. Since its founding in the 1600s, New York has been a center of trade and freight transportation. The city and other regional governments are working to ensure that New York remains competitive with other freight handling centers into the next decades. This is the type of information you will learn on a Sights by Sam tour. Aside from Las Vegas and Tokyo, New York is probably the most famous city that is flooded with electric lighting. The lighting comes in many colors, illuminates homes and businesses at affordable prices, and gives the city its “city that never sleeps” reputation. Electric lighting has had one of the most profound effects on the evolution of the metropolis. Its history is quite interesting and made New York what it is today. Electric power was invented in the early 1800s and had sporadic demonstrations through most of that century. Supposedly on the same day as Edison’s light bulb made the newspapers, the display of an electric streetlight was made in Lower Manhattan by the Electo-Dynamic Light Company, a company formed by a man from Brooklyn and a man from Manhattan, according to the New York Times. The technology became viable in the 1870s when Thomas Edison patented a Direct Current transmission system. After conflicts between rival power formats, Westinghouse and its AC/DC hybrid system won out against Edison’s DC system. Once the technology became commercially successful, electric lights and signs started popping up all over New York—leading to Broadway becoming the “Great White Way” by the 1890s. Theaters also replaced gaslights with electric lighting, removing the threat of fire and also noxious gas building up in enclosed spaces. This coincided with the city replacing gas lamps with electric lights in most parts of the city. In the coming decades, electric lighting systems would be added to buildings. By World War II, neon signs and fluorescent lighting (first shown in the 1939 World’s Fair in Queens) would become commonplace. Electricity also helped to power the subway system, leading to the end of soot-belching elevated train locomotives and providing clean power to the transit system. As the need for electricity grew, the city developed a vast electric power grid that stretches deep into Upstate New York. While many facilities inside and outside of the city were originally powered by coal, the region now receives its power through nuclear, natural gas, and hydroelectric power. Thousands of miles of power cables snake through the city and the metropolitan area. Consolidated Edison is the city’s main electric utility, providing electricity to consumers over a 660 square mile service area. According to the New York Times, the peak load on the grid is at evening rush hour when commuters are going home and students return from school and power up computers, video game consoles, and charge cell phones. Because of the demand for maintaining infrastructure in the city and very strict New York State regulations on electricity generation, residents of the city pay some of the highest electric bills in the country. Some of the most famous places to see electric lights in the city are at Times Square (where city ordinance mandates the placement of electric billboards), the tops of tall buildings (including the Empire State Building, One Bryant Park, and Four Times Square), and through Koreatown in Manhattan. Pell Street in Manhattan Chinatown and Flushing, Queens are also great locations to see lights (and get great food). Building on the success of the subway being powered by electricity, the MTA is powering many new buses by electric-hybrid engines and many city vehicles are gradually becoming battery powered. 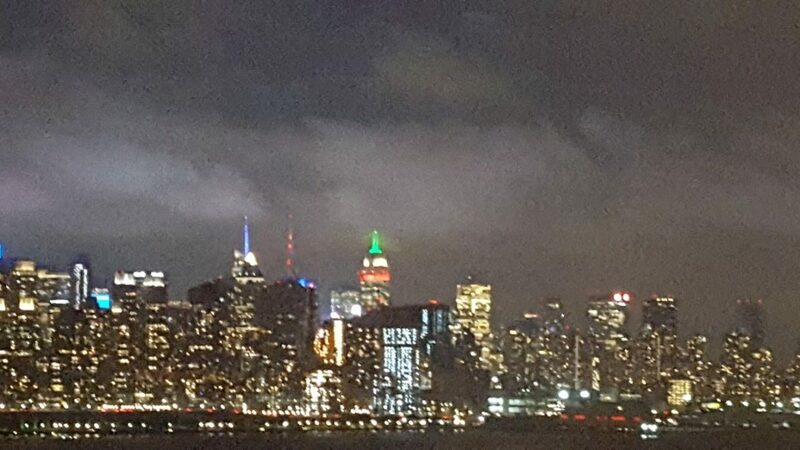 Electric lights can be seen in their blazing glory on the legendary “Nighttime Manhattan-Crowned Heads” tour with Sights by Sam. Visitors to New York come into the city in several different ways. For visitors coming from Denver and cities east of the Rockies, many will arrive at LaGuardia Airport. While many believe that the airport does not provide the best introduction to the city (some people say, “the only good thing about it is whom it is named for”), LaGuardia Airport has a storied history and is looking toward a better tomorrow. In 1929, an amusement park in Queens on the water in Elmhurst was demolished to build a general aviation airfield. This airfield would later be pressed into commercial service in the 1930s when Mayor Fiorello LaGuardia of New York was returning from a meeting by airplane. His flight landed at EWR airport in Newark, NJ. LaGuardia was upset that his ticket had said “New York”, but the aircraft landed over 15 miles away in another state. LaGuardia had the pilots land their aircraft (after the other passengers had disembarked) at Floyd Bennett Field in Brooklyn, where he held a press conference exhorting the need for an airport in the city. It would not be long before the small general aviation field would be expanded and named after Mayor LaGuardia (against his wishes). LaGuardia Airport was sited on the Long Island Sound, as many flying boats flew internationally in those days (the Marine Terminal at LaGuardia is testament to this). Over time, LaGuardia grew too busy to handle the traffic and the city began quietly buying up land (and the Idlewild Country Club) in Jamaica, Queens to build a second, larger commercial airport (now the well-know JFK International Airport). Today, nearly 30 million passengers fly into the airport. The cramped four terminals are often the subject of complaints by angry travelers and civic boosters seeking a larger, more orderly, and spacious facility. 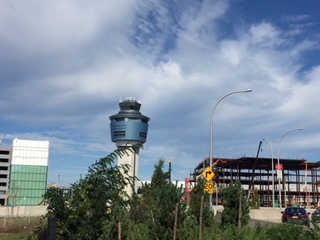 The Port Authority of New York and New Jersey (owners and operators of LaGuardia Airport since 1947) has planned a $4 to $5 billion construction effort to tear down three of the separate terminals and combine them into one continuous, modern facility. Additionally, the airport will be connected to the NYC subway’s 7 train via a people-mover system. Construction began in 2016 and is expected to conclude in the early 2020s. This is the type of information you will learn on a Sights by Sam walking tour. Alternatively, you can soar through Queens on a privately-led Sights by Sam tour of nearby Flushing Meadows-Corona Park or the Louis Armstrong House—to name but two great sites near the airport. Brooklyn is the most populous of the five boroughs of the city. For most of its storied history, the borough was known for its industry. Facilities such as the Brooklyn Navy Yard and several factories producing items that included sugar, brillo pads, and pencils (to name but a few of the many commodities) dotted the landscape of Kings County. 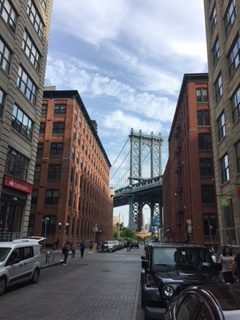 Among the most famous industrial areas (which has changed and is no longer such) is Down Under the Manhattan Bridge Overpass—or, DUMBO. Long a manufacturing area, the DUMBO neighborhood was known by many names throughout its history. The tall lofted buildings were ideal for factories when they were built, but they became obsolete in the era after World War II. In the postwar period, the lofts were abandoned but gradually became used by artists, writers, and other creative types starting in the 1970s. Not only were the lofts sought after, but there are also cobblestone streets in the district. The great views of the Manhattan skyline, access to the subway, and the bridge led to the gradual rising popularity of the neighborhood. The DUMBO name moved from a term used by realtors to one commonly used by many in the city. A citywide reduction in crime starting in the 1990s helped to make the area more desirable to visit and live. As the neighborhood began to increase in popularity, the rents and cost of land gradually increased. This neighborhood is now the site of several corporate headquarters such as West Elm and Etsy. DUMBO is becoming more popular with the recent completion of Brooklyn Bridge Park, bringing more people to this great part of the city. 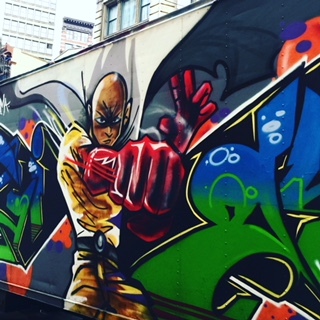 In addition to learning about this neighborhood on a Sights by Sam walking tour, see the area on our “Borough of Brooklyn” tour. On Eighth Avenue sits the general post office building for New York. Designed by the firm of McKim, Mead, and White and completed from 1912 to 1914, this structure was named after the 53rd Postmaster General of the United States, James A. Farley. The post office covers eight acres. It is most famous for its monumental message by Herodotus (from commenting on the Persian Empire’s postal system): “Neither snow nor rain nor heat nor gloom of night stays these couriers from the swift completion of their appointed rounds”. The post office was built over the railroad tunnels made for the Pennsylvania Station. Like similar main post offices in Washington, DC (no longer used) and in Cincinnati, the general post office was sited on a railhead to help move mail into and out of the city. Before mechanization and computerized sorting, thousands of people worked around the clock inside its vast walls. Until 2009, this post office was the only mail counter in New York that accepted letters and packages 24 hours a day, seven days per week. The interior of the building that most customers see is quite ornate and includes the seals of the United States and other countries in the early 1910s (the Austro-Hungarian Empire and Kingdom of Greece are pictured, though no longer in existence). In recent years, there has been a movement to replace the underground (and arguably unloved by many New Yorkers) Pennsylvania Station with unused space in the Farley Post Office. This proposal is known as Moynihan Station—named after the famous New York Senator, Daniel P. Moynihan (who also grew up in the neighboring area of Hell’s Kitchen). Converting the station will cost nearly $2 billion and will accommodate Amtrak and Long Island Railroad service. The Farley Post Office is a great place from which to send a letter to friends and family about your great Sights by Sam tour. This is the type of information you will learn on a Sights by Sam tour. New York is a major magnet for people coming in to work and visit. As I have mentioned before, Manhattan has a daytime population of over 4 million people. 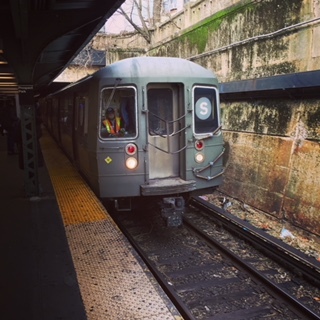 While the Metropolitan Transportation Authority’s bus and subway services carry millions of people around the city, thousands come into the city by train from New York, New Jersey, and Connecticut every day. Although some consider the Port Authority’s PATH trains to be commuter rail (this system is covered in another Sights by Sam blog article), this post will cover the three main commuter rail systems converging on New York City: the Long Island Railroad, Metro North Railroad, and New Jersey Transit railroads. 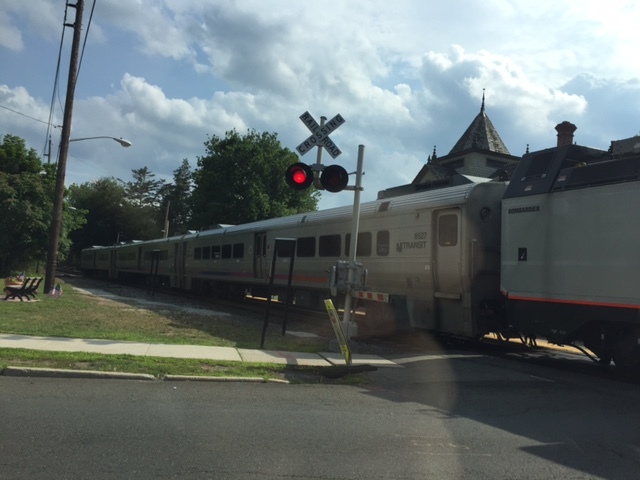 Carrying over 350,000 people into the city every week on 12 routes, the Long Island Railroad was founded in 1834 and is one of the oldest railroads in the U.S. (it is believed to be the oldest railroad retaining its original name). The railroad helped to develop Long Island and led to the increased settlement of Nassau and Suffolk Counties. While the Long Island Railroad was once an affiliate of the Pennsylvania Railroad, it is now an arm of the Metropolitan Transportation Authority. The railroad terminates at Penn Station in Midtown Manhattan in addition to major terminals in Brooklyn and Jamaica, Queens. In the next decade, the Long Island Railroad will begin to serve Grand Central Terminal as part of the massive “East Side Access” tunneling project. Bringing commuters from Upstate New York, New Jersey, and Connecticut, the Metro North System carries over 300,000 people into the city daily via three lines fanning out from Grand Central Terminal in Midtown Manhattan and two additional lines that go into Upstate New York (going through New Jersey and terminating at the Hoboken Terminal in nearby Hoboken, NJ). Metro North service has been improved in recent years with new rolling stock. Before being taken over by the MTA, Metro North services were operated by the New York Central Railroad and other services. This commuter system is known for its ornate terminals at Grand Central and Hoboken Terminal. The third major commuter railroad serving New York comes from New Jersey. The New Jersey Transit system, carries 240,000 people into New York daily on ten of its 11 lines (one rail line goes from Philadelphia, PA, to Atlantic City, NJ). 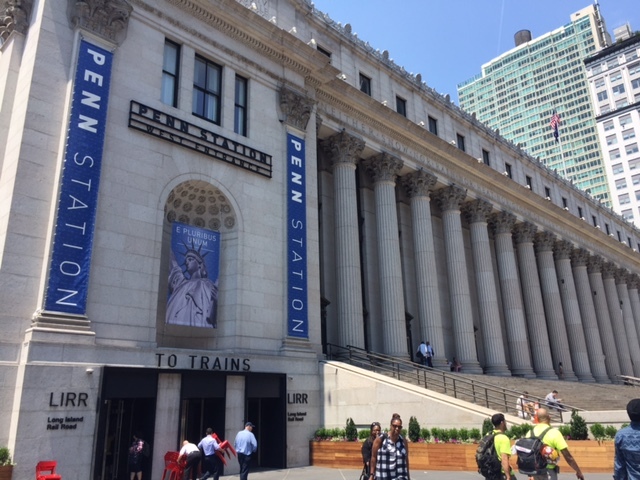 Commuters arrive from all corners of New Jersey through Penn Station. Other services arrive at Hoboken Terminal or terminate at the massive Secaucus Junction. New Jersey Transit, headquartered in Newark, NJ, was formed in 1979 and unified rail services previously run by other operators and the bus services of the Public Service Enterprise Group (a major electric company in the Garden State). These three systems help to bring thousands into the city daily. Due to the high price of land and housing in New York, these commuter rail systems allow people to work in Manhattan (or in the outer boroughs) while living further afield. While these railroads help people come into the city and take thousands of cars off of the street, they are under increasing strain from high use and aging infrastructure. This is the type of information you will learn on a Sights by Sam Walking Tour, with major rail stations of the city being shown on tours of Manhattan and Brooklyn. In a crowded urban area, fire is one of the greatest threats to New York—or any city for that matter. After three great fires in the Colonial and Antebellum Eras, New York has worked to defend itself against fire through volunteer and professional fire companies. In addition to these fire companies and local citizens reporting fires, the city has relied upon fire towers and fire call boxes to report flames. As in many areas around the world, New York once had an extensive system of fire watch towers. At one time in the 1850s, there were 11 cast iron watch towers across the city—with two of the most prominent located in Greenwich Village and Harlem, respectively. Scouts would scan the horizon for smoke or flames and then summon firefighters by bells. After the Civil War, this system fell out of use as telegraphs became more widespread. 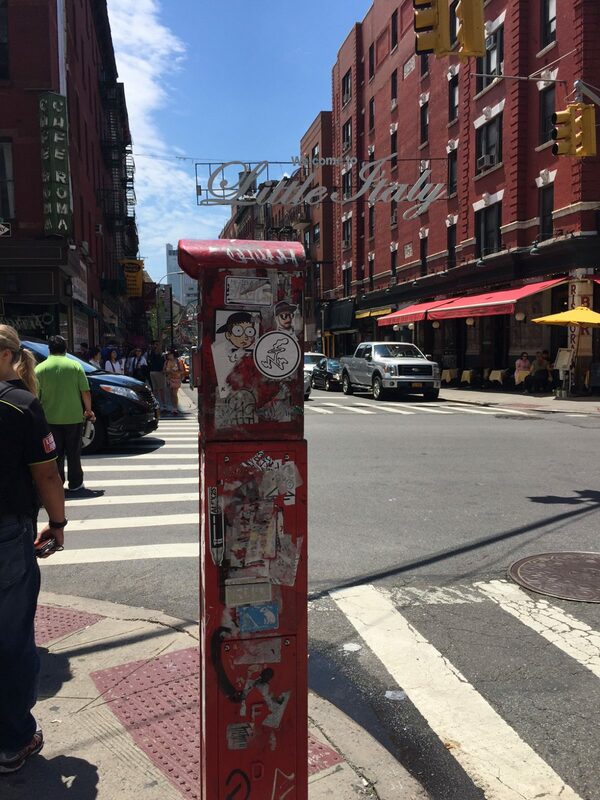 Starting in the 1870s, the city started to install telegraphic call boxes on the streets in crowded districts. The original call boxes worked by sending a telegraphic signal to a dispatch center, which would then telegraph the firehouse nearest to the box to respond to the emergency. Today, there are estimated to be 15,000 fire call boxes on the streets. Many produced since World War II allow the caller to speak directly with the police or fire departments. With the advent of cell phones, these boxes have become less used and calls have risen for them to be removed. The FDNY states that less than three percent of calls to report fires are from the boxes and of these, 88 percent are false alarms. This is the incinerating type of information you will learn on a Sights by Sam walking tour.